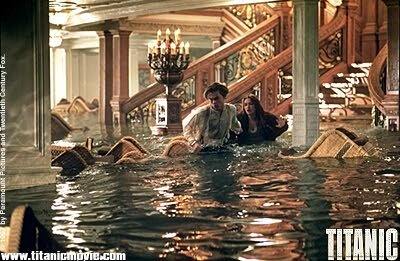 The movie TITANIC certainly lives up to its name in writer/director James Cameron's vision of the fateful shipwreck over the icy Atlantic. First of all, the movie was titanic in length lasting over three hours. However, the movie lingered not one minute providing a wonderfully romantic love story, suspense, action, humor, and some of the most amazing special effects ever brought to the big screen. It is a rare honor that is bestowed upon a film when it can be said that the movie really "takes us there." And James Cameron (Terminator, Aliens, The Abyss, Terminator II, True Lies) really took us there in more ways than one. The movie begins with actual footage of the shipwrecked Titanic lying motionless on the ocean floor. Deep dive cameras work their way through what was once "invincible" revealing what now remains of this "ship of dreams." Later we are given a computer-simulated encounter of the events of the wreck itself foreshadowing what was to come in the inevitable flashback. 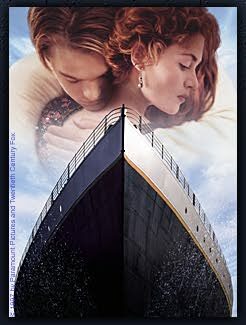 What was truly enjoyable in itself, however, was the love story told about Jack Dawson and Rose DeWitt Bukater. Jack (played wonderfully here by Leonardo DiCaprio, a.k.a. Romeo) is a third class roamer and aspiring artist who wins his ticket aboard the Titanic in a poker game five minutes before it leaves for sea. Rose (the beautiful Kate Winslet), is a first class young woman betrothed to a first class young man named Cal Hockley, who is desirable only by his pocketbook. The Titanic then serves as a convenient setting for this epic love story. But love was not the only thing on Cameron's mind in the making of this movie. This movie brings with it the year's best in special effects. It was truly captivating to watch a ship lying in ruin transform into the awesome splendor that it once was, and later, back again. And the actual wreck itself was more realistic than any of us could have asked for. This movie simply outdid itself placing it among the greatest movie experiences of all time. The musical score intensified the emotions, comedic breaks were inserted at the perfect times relieving built-up tensions only to have them return again, and the many different reactions of each character in the film to this horrible disaster leaves us all wondering how WE would behave in such a situation. I simply could not ask for a better movie. This movie simply has everything. I probably experienced every emotion known to man during these three hours: awe, sadness, excitement, joy, thankfulness, humility, fear, horror, triumph, and love. 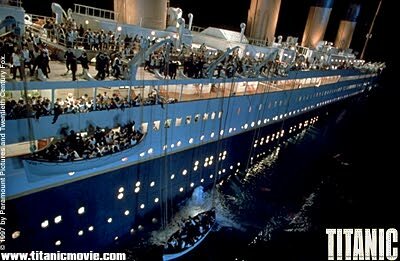 How would you rate the movie TITANIC? There have been 46958 people to visit this page since Fri, Dec 26, 1997. And you are the first person to visit this page today!